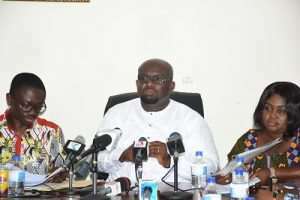 The University Teachers Association of Ghana (UTAG), has welcomed the reinstatement of three dismissed staff of the University of Education Winneba (UEW). They are demanding a lasting solution to the impasse at the university. UEW has been closed down for nearly a month after students staged a violent protest over the conduct of the Vice Chancellor, Prof. Afful Broni which they termed authoritarian and full of vindictiveness. Prof. Afful Broni had sacked some staff and lecturers of the school; a move which angered some of the students. The root cause of the impasse has been many legal tussles that have rocked the institution for the past years, resulting in the ousting of Prof. Mawutor Avoke from his position as the Vice Chancellor of the university. There are already calls for the resignation of the current Vice Chancellor, Prof. Afful Broni over the matter. The school is also expected to resume on April 8, 2019. But Dr. Eric Opoku Mensah, the UTAG President, has told Citi News the association is hoping that the current development will help end the impasse at the school. Dr. Eric Opoku Mensah, further urged other stakeholders to commit to the ongoing processes to ensure lasting peace on the school's campus. Meanwhile, one of the reinstated staff at the school, Prof. Avea Nsoh wants the institution's Governing Council to reinstate all other dismissed persons as it begins processes to resolve the crisis in the school. “I don't think this is holistic enough and it appears discriminatory. This is not to say that the council has not made an effort to reinstate us. We really appreciate that but we think that is not good enough because we have some of our colleagues still standing out there. There are other demands but the first goodwill is to say that everybody, come back, and then we can move from there,” he said in a Citi News interview.